Iodine is a critical and required nutrient for proper thyroid function. Low levels of iodine result in decreased thyroid function and a litany of other negative side effects ranging from low energy to weight gain. ​And while supplementing with iodine stands to help many patients, it shouldn't be used without proper knowledge. In this post, I will explain why and how to use Iodine supplements correctly, who should consider using these supplements and the best and safest way to supplement with iodine. Will taking Iodine help with weight loss? ​Is taking iodine good for you? Is iodine good for thyroid problems? Is iodine safe to use in Hashimoto's? Is using Iodine safe with Hypothyroidism & Hashimoto's? I haven't been shy about which supplements I think are best, and certainly, not all supplements are created equal. When it comes to supplements that have the potential to help you turn the corner I put Iodine up there at the top (along with B12 shots and some adrenal supplements). ​Iodine was a very important part of my healing process and my journey back to health, and I've also experienced some impressive results when using it in patients. Having said that there is also a lot of confusion surrounding the use of Iodine in hypothyroidism and Hashimoto's. Should you use it? Is it dangerous? Should I avoid it? When it comes down to it people are scared to use iodine because they fear that it may actually slow down their thyroid and reduce thyroid hormone production. And this is true, it might. Both of these conditions appear to blunt thyroid hormone production, but there's more to it than that. The Wolff-chaikoff effect is a complete block in thyroid hormone production after ingestion of high doses of iodine. This effect is quite powerful and has been used in the past to treat patients with hyperthyroidism and thyrotoxicosis (1) (yes, high doses of iodine can actually TREAT hyperthyroidism). This complete block of thyroid hormone is felt to be a safety mechanism that the body uses to block the massive release of thyroid hormone into the bloodstream. The body senses the large dose of iodine and to prevent the massive release of thyroid hormone it prevents the release of all thyroid hormones. It's important to note that this effect only occurs if there is ALREADY sufficient iodine in the thyroid gland. So this will not happen if you are iodine deficient (unless your dose is VERY high). In addition, this effect is only temporary and lasts about 10 days. In fact, you can reverse the block by simply taking more iodine. In this condition, when your body notices a large dose of iodine it responds by temporarily increasing your TSH. This increase in TSH is felt to be a regulatory response to "counteract" the high dose of thyroid hormone. This change does result in an increase in TSH which is measurable in the serum. Like we've noted before, it's not always wise to assume that the TSH can predict thyroid function as a marker by itself and in this case, it's no different (in fact studies show us that TSH as a marker of euthyroidism (2) isn't accurate). It turns out that this rise in TSH is a compensatory (meaning a normal and autoregulatory response) designed by your body to counteract the reduction in thyroid hormone production. By increasing the TSH your body is telling your thyroid to produce more thyroid hormone and balances out the effect on the iodine. You aren't actually hypothyroid just because your TSH increased. Hopefully, this is making sense now. In fact, this system is believed to exist to balance thyroid function with iodine intake and meant to make sure that your body doesn't overproduce thyroid hormone when it receives large quantities of iodine. It's important to understand how iodine may impact your thyroid function so you understand what may be happening when and if you decide to take iodine. This misunderstanding about how iodine interacts with your thyroid has led many people to simply recommend total avoidance of iodine. ​Some people fear that using iodine in patients with Hashimoto's may make the condition worse, and it can - but only in patients with concomitant thyroid issues and those on medications that are known to interfere with thyroid function (lithium, amiodarone, etc.). In the majority of cases, and if used correctly, iodine can be safe to use in patients with both hypothyroidism and Hashimoto's. But it must be done carefully, with the right supplements and done over a certain period of time. Taking the combination of iodine with selenium can help prevent any negative effects - such as an increase in thyroidal antibodies that have been shown to occur in some studies (3). Selenium is is a component of glutathione peroxidase and superoxide dismutase which both help to protect against free radicals, in addition, it's also a component of type I 5 deiodinase. Because of this low levels of selenium may predispose patients to develop free radical damage and lower than normal T4 and T3 levels. 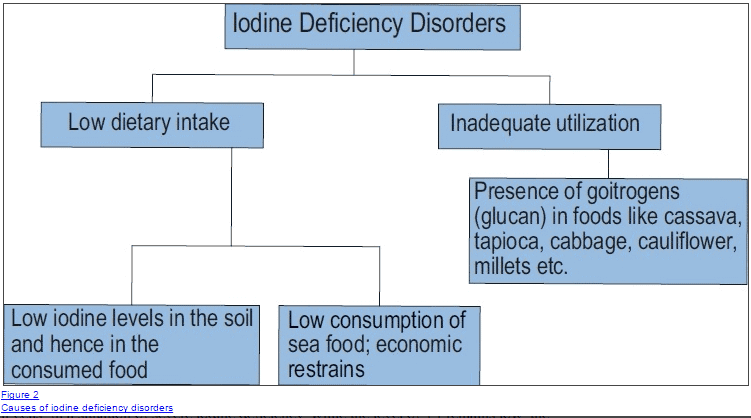 Effectively selenium deficiency can make iodine deficiency worse. But supplementing with both selenium and Iodine has been ​shown to reduce TSH and result in an increase in peripheral thyroid hormones and may protect against an increase in thyroid antibody increase in patients. Iodine is required for proper thyroid hormone production. The 4 iodine moieties make up the T4 thyroid hormone. When 1 iodine is cleaved off by the hormone deiodinase you are left with 3 iodine moieties and the active thyroid hormone T3. If you don't have these iodine moieties then you simply won't be able to produce thyroid hormone. This may explain why some patients experience dramatic improvement when they supplement with iodine. If their thyroid is low on iodine (suboptimal tissue levels) or if their thyroid is full of other halides (we will talk more about this later) then thyroid hormone production may be limited. Supplying your body and your thyroid with sufficient iodine levels can open up the floodgates to help create more thyroid hormone. ​So we know that iodine is important, but how do you know if you need iodine? The good news is that there are several ways to figure this out, and one of them is to evaluate your symptoms. Iodine deficiency (in suboptimal amounts) causes many non-specific symptoms. Most people focus on the big symptoms of complete iodine deficiency like cretinism, goiter or mental retardation - but what about patients who have some iodine, but suboptimal levels? These patients present with different symptoms entirely. How can you be iodine deficient if you live in an area of the world that adds iodine to salt and other products? How can you be iodine deficient in iodine "replete" areas? Ingestion of iodine doesn't necessarily equate to complete utilization of iodine. Meaning you may be able to take in the appropriate amount of iodine through your diet, but that doesn't mean that you are adequately utilizing the iodine that you ingest or that the iodine you ingest is even being absorbed. Changes in hormone levels such as estrogen and testosterone can influence the absorption of iodine. High estrogen inhibits iodine absorption and testosterone increases iodine absorption (9). Nowadays with the prevalence of insulin resistance many patients are walking around with higher than normal estrogen levels and lower than normal testosterone levels. ​Chemicals that we come into contact with on a daily basis interfere with iodine absorption into the thyroid gland and interfere with thyroid function in peripheral tissues. This includes compounds like bromide which is found in bread and soft drinks. And even compounds like perchlorate which is ubiquitous (meaning it's found all over the place). 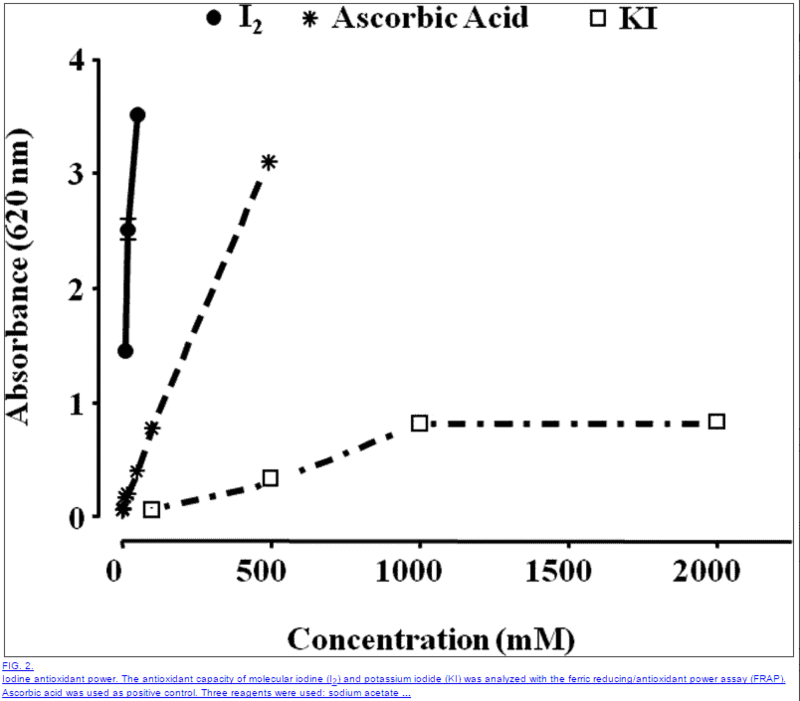 Bromide concentrates in the thyroid gland and interferes with proper thyroid hormone production (10) while perchlorates act to decrease iodine entry (11) into the thyroid gland. This reduction in iodine entry into the thyroid acts to exacerbate insufficient iodine levels in the body and make symptoms worse. Perchlorates have been found in the following areas in the US: cow's milk, cucumber, lettuce, soybeans, eggs and even in prenatal multivitamins. In addition, small amounts have been found in drinking water (12) in communities in the US. ​This isn't mean to scare you, but simply to illustrate how some patients in iodine "replete" environments may ingest sufficient iodine levels through their diet, but may not be utilizing the iodine correctly. ​Some physiological states require an increased level of iodine due to increased demand and metabolism of thyroid hormone. A perfect example of this is in pregnant women and in lactating women (13). During pregnancy, the child has rapid turnover of thyroid hormone in the thyroid gland which results in an increasing demand for iodine in the mother. Because of this, it is recommended by the WHO that pregnant women and lactating women get 250 ug of iodine per day. On the flip side, we can see the average daily consumption of iodine in the US to be slightly less than that. Studies dating back to the 2005-2008 (14) show that the average daily consumption of iodine in the US to be 130 ug per day. So the demand for iodine in pregnant and lactating women is 250 ug per day and yet the average consumption is 130 ug per day. This average doesn't even make it to the daily recommended value of 150 ug per day. ​Many patients undergo dietary programs including programs like Jenny Craig, Nutri system and Medifast which all have been shown to have inadequate iodine content in their food (15) to meet the demands of the recommended daily intake at 150 ug of iodine/day. ​With weight gain being so prominent in the US (much of it related to hormone imbalances that aren't well appreciated or diagnosed) it's easy to see how some patients may further deplete their iodine stores while undergoing these types of programs. Even if you exclude these dietary weight loss programs it has been shown that patients who are obese have an increased risk for developing iodine deficiency (16). The good news is that replacing iodine levels in patients who have suboptimal or even deficient iodine levels results in rapid reversal of many of the symptoms listed above. And this is where supplementing with iodine can be particularly helpful - in the reduction of those symptoms. In many cases that I've used iodine as a therapy in hypothyroid patients, the benefits tend to be an improvement (and reduction) in hypothyroid like symptoms. In some patients, this can manifest as an increase in energy, a reduction in hair loss, an increase in hair loss, etc. The positive side effects of iodine supplementation largely depend on what kind of symptoms you were experiencing due to the deficiency. In my own personal case (as a male without hypothyroidism) I found iodine supplementation to significantly improve my symptoms of fatigue and low energy levels. I attribute much of my own personal gain to adding an iodine/iodide supplement to my regimen which dramatically increases my energy levels. The same is true of many of my patients that I use iodine on as well. But beyond these positive side effects, supplementing with iodine/iodide can improve other aspects including improved immunity, a reduction in antioxidants and even improvement in prostate/nerve health/breast tissue/gastric tissue. Bottom line: Supplementing with Iodine and/or Iodide may have multiple positive benefits. The benefits each person experiences will depend on how deficient they are and their own personal symptoms. When it comes to supplementing with iodine, not all supplements are created equal. ​For lower doses it's often easier to use iodine sourced from kelp and as you increase your dose to include combinations of both iodine and iodide. The supplement I recommend below includes a combination of iodine + whole food kelp which provides iodine naturally from the plant in addition to other iodine sourced from kelp. With a low starting dose, you can begin a trial of iodine to see how your body reacts and then increase your dose accordingly. Supplementing with Iodine can be difficult. I have only had 2 documented scenarios in which patients truly reacted negatively to Iodine supplementation and many more patients who have done quite well on Iodine. If possible I recommend testing your urinary excretion of iodine prior to supplementation. If you decide not to test yourself then start out at very low doses (~200-300mcg/day) and slowly increase the dose based on your symptoms. In most cases, patients aren't sure if they have an iodine deficiency, but they've heard of impressive results from other patients which have led them here. Studies have shown (25) that taking iodine doses ranging from 1.8mg to 3.2mg per day in euthyroid (normal thyroid patients) are tolerated very well. Patients with pre-existing thyroid conditions (listed below) can tolerate iodine levels safely as long as they are less than 1.5mg per day. In my experience patients with thyroid issues like Hashimoto's can tolerate even more iodine, but it must be accompanied by normal and optimal Selenium and Iron levels. I included this information to show you that starting at lower doses may be safe in most thyroid conditions. With this information in mind, I recommend starting with a low dose of Iodine and then slowly increasing your dose as long as you tolerate it. Patients who don't tolerate the Iodine will know quite quickly and they can simply reduce or completely stop taking the iodine. The good news is that any negative side effects related to taking iodine are rapidly reversed once you stop taking it. On the other hand, most studies show the most benefit from iodine when the dose is 3mg-6mg + per day (26) (but this doesn't mean you HAVE to have this much for the benefit). ​A safe approach is to start with an iodine dose of 200-300mcg per day and slowly titrate up the dose by 200-300mcg every 7-14 days (provided you tolerate it well). It's also very important that you have adequate selenium levels and adequate iron levels. Selenium can be tricky to dose and use. I've found that certain patients do well with higher doses of Selenium and others who do not. If you have Reverse T3 issues or Hashimoto's I do recommend a trial of this nutrient even if your serum levels are "normal" (27) (some people just need supraphysiologic doses). If you decide to supplement with Selenium I recommend no more than 400mcg per day and to start out in the 100-200mcg range. I find patients get better results by combining iodine with other products such as selenium, zinc and other products designed to improve thyroid function. In addition to Selenium, it's also critical to have adequate iron levels. You can learn more about testing for iron deficiency and testing for suboptimal levels in this post. Kelp supplements can also be used as a way to get iodine into your body. ​Kelp contains natural amounts of iodine that is absorbed into the body. People living in Japan have the highest dietary concentration of seaweed which results in a diet high in iodine. It is estimated that the amount of iodine consumed from seaweed including kelp ranges from 1,000 mcg to 3,000 mcg per day. 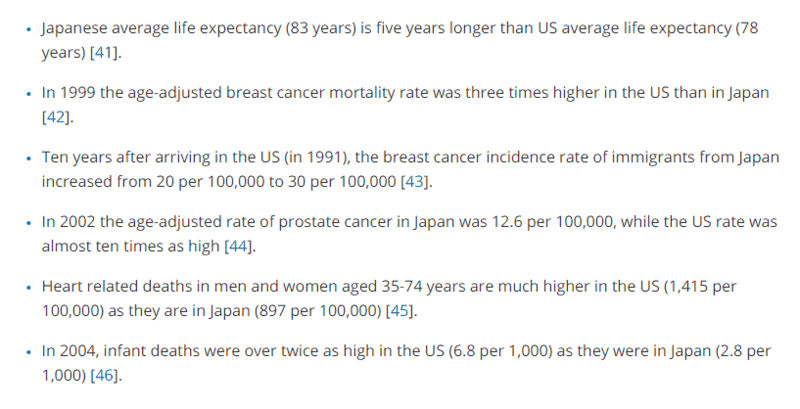 The Japanese are considered to have some of the worlds longest living people in it and have very low rates of cancer, some of these health statistics have been felt to be related to their daily iodine intake from seaweed. Kelp supplements should be differentiated from pure iodine supplements. The former usually contains ground up whole kelp (seaweed) which will naturally contain iodine. The latter usually contains iodine/iodide without the whole kelp product. ​Your thyroid isn't the only tissue in your body to utilize iodine. In fact, almost every cell in your body needs iodine to function correctly. Low iodine in your salivary tissues may result in dry mouth, etc. 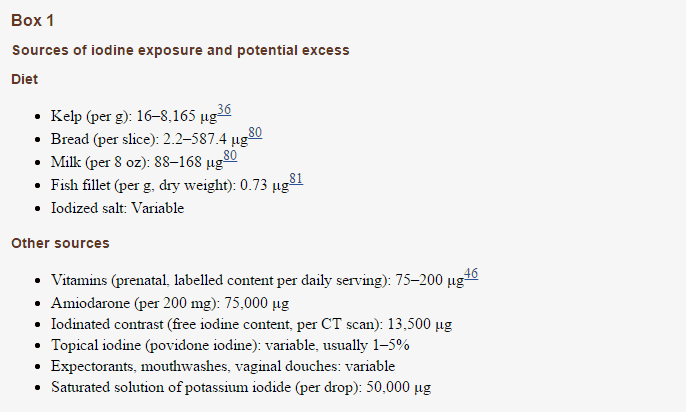 It's important to add this to the discussion because some tissues require iodine while others use iodide (28). Your thyroid, salivary glands, and skin cells all use iodide, while your breast, prostate, and stomach all utilize iodine. Liquid iodine supplements (in this case Lugol's solution) contain both Iodine and Iodide. At 2% each drop of Lugol's contains approximately 1.0mg of iodine and 2.0mg of potassium iodide. Liquid iodine like Lugol's solution allows for titration of both iodine + iodide in low doses and can help avoid negative side effects from larger doses of iodine. Using this 2% Lugol's solution can help you titrate up into that 3mg of Iodine dose per day without experiencing negative side effects of larger doses. I recommend using ​if you can tolerate lower doses of Iodine and you are continuing to titrate your dose. Not all patients will experience side effects while taking Iodine which is why I've included this section. 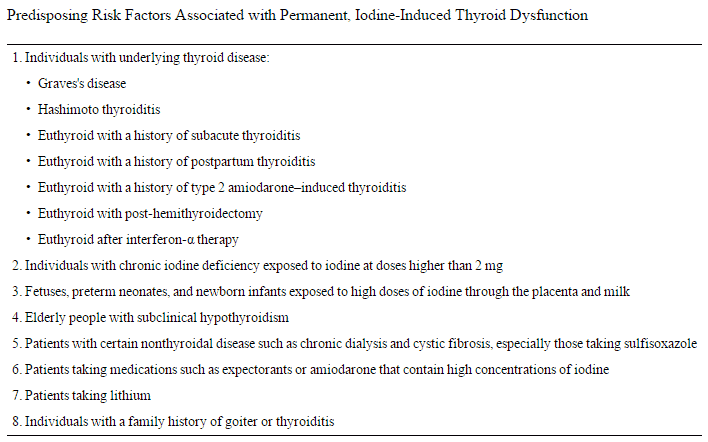 Taking Iodine can precipitate negative symptoms, especially in certain patients with Hypothyroidism and Hashimoto's. In most cases these negative side effects result from taking too much iodine too quickly and when taking iodine without other supplements such as selenium and/or iron. ​If proper precautions are taken then in most cases you shouldn't experience negative side effects of taking Iodine, but some patients tend to be more sensitive than others. Despite these potential issues, it's felt that the benefits of taking iodine outweigh the potential risks (29). Like anything, it's important to be informed about all of the potentially positive side effects, in addition to the potential negative side effects as well. One question that many of you are wondering is will taking Iodine help with weight loss? Like most things, there is no easy answer but if there were it would be maybe. As you know weight loss depends on a number of factors (including proper thyroid function). If you have hypothyroidism (or even suboptimal thyroid hormone function) due to suboptimal iodine levels or a frank iodine deficiency then taking iodine may help you lose weight. Weight loss related to iodine supplementation is more likely to be related to a combination of factors. Improved energy levels resulting in increased activity. 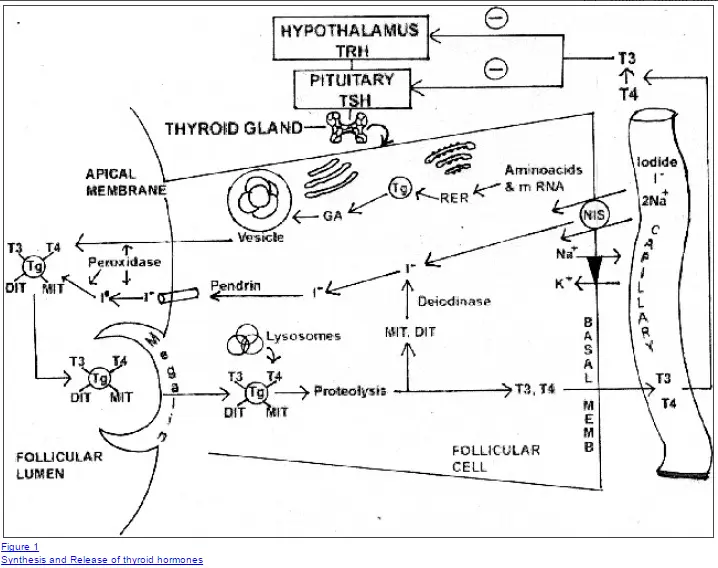 Increased thyroid hormone resulting in increased basal metabolic rate. Increased thyroid hormone resulting in more muscle mass. Increased activity level due to increased energy. All of these factors likely play a role in helping patients lose weight when supplementing with iodine. Having said that I wouldn't go into this with the expectation that you will lose a ton of weight. Instead, focus on your symptoms and improving how you feel and any weight loss that occurs will simply be an added bonus. If you prefer to try and get iodine from foods, then you can use this list below to try and increase your dietary intake of iodine. Be careful of consuming large quantities of iodine from food sources, however. If you do decide to use food as your primary source of iodine then I would recommend that you start out slow and try to follow the guidelines set in place by the Japanese. We know that in most cases eating food to get you to the 1,000mg to 3,000mg range will likely not cause any problems. While some patients may need more due to various factors, I would recommend assessing this case by case. Because of these reasons even people who live in iodine "replete" areas may actually be deficient in iodine. Replacing iodine stands to be helpful in many cases but in order to supplement safely with iodine you should make sure that both your selenium and iron stores in your body are optimal. Supplementing with iodine in a small subset of people may actually reduce thyroid function. To prevent any negative side effects it's best to start low and go slow with iodine replacement. Levels up to 3.0mg per day have been shown in studies to be safe and this mimics the average daily intake of the Japanese who live long healthy lives. ​Iodine is essential for proper thyroid function in small amounts. Should I be taking additional iodine beyond what I get from my diet? That answer is less clear and largely depends on your personal situation. I recommend evaluating your diet to see if you are consuming enough and then putting that into context with other nutrient deficiencies like Selenium and Iron. Remember that one of the causes of hypothyroidism is inadequate iodine consumption/utilization. If your case of hypothyroidism is caused by suboptimal iodine intake then taking iodine may actually dramatically improve your thyroid function. Generally, if iodine is taken with selenium, then using iodine if you have Hashimoto's is well tolerated. This is not true for every person, however, and so iodine should be used on a case by case basis if you have Hashimoto's or another autoimmune thyroiditis. This list is not exhaustive but it serves as a good starting point to help determine if you should consider a trial of iodine supplementation.